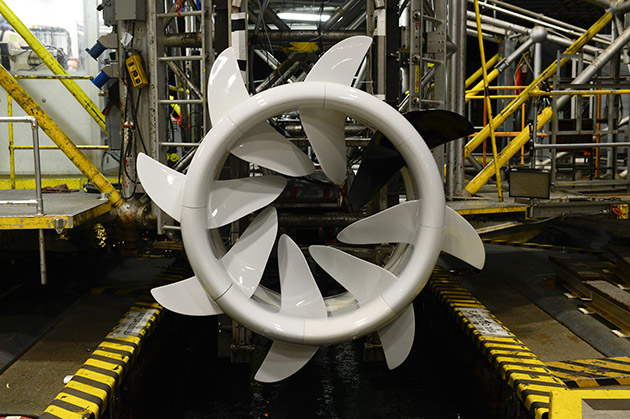 Marine hydrokinetic energy power generation is an emerging sector in the renewable energy portfolio. Hydrokinetic devices convert the energy of waves, tidal currents, ocean currents or river currents into electrical power. Power generated using water currents is very attractive because of the predictive behavior of these sources as compared to other less-predictable renewable sources, such as wind and solar. Most rural Alaska villages are located along rivers and are off-the-grid. These villages rely on local diesel generators for their electrical power, but that diesel must be either barged or flown to the villages because they are not accessible by roads. This can result in the cost of electrical power being over 70 cents per kilowatt hour, which can be over ten times the amount paid by grid-connecting customers. The people in these rural villages are typically the least able to afford the high cost of energy. Rural Alaskan villages—as well as anyone with individual, commercial, or scientific needs for remote power in areas near river systems—could benefit from the use of hydrokinetic power. Oceana Energy Company is developing a tidal-energy collection device and, with a grant from the Alaska Energy Authority (AEA), they have assessed the application of their device in the more challenging environments of rivers. Turbulence and floating debris pose distinct challenges when deploying hydrokinetic devices in rivers. Oceana designed and built the next generation of their device in 2014 with the intention of obtaining performance data in a river setting. Oceana has a cooperative research and development agreement (CRADA) with the US Naval Warfare Center, Carderock Division, in Bethesda, Maryland, where they provide hydrodynamic analytical and testing support. The Oceana device includes a series of hydrofoils that extend radially inward and outward from the annulus-shaped rotor. The mating annular stator includes a patented nine-phase electrical generator and permanent-magnet bearings. The first step in assessing the performance of the Oceana device was to test it in the David Taylor tow tank at Carderock. The tow tank is an approximately half-mile-long indoor pool with a powered carriage that supports and pushes the device through the still water of the tank. This setup provides a very clean and controlled set of performance data that included: electrical currents, voltages, power, rotational speeds, and drag forces on the device, along with a signal of the carriage speed. All these signals were recorded at 625 Hz using a Campbell Scientific CR9000X datalogger. Successful testing of the device was completed at Carderock in August 2014. The second phase in the assessment of the Oceana device was an in-river deployment under realistic conditions. The Alaska Center for Energy and Power (ACEP), which is operated by the University of Alaska, Fairbanks, has established a river hydrokinetic test site on the Tanana river near Nenana, Alaska. During mid-September of 2014, Oceana deployed their device off the ACEP barge. The device performed as expected, with a projected power output of over 20 kW. Performance data was recorded under a variety of conditions. Another series of similar tests is scheduled for July 2015.